It's hardly the best kept secret, but Nintendo has finally confirmed that it is to release a big screen DSi in Japan next month and in Europe early in 2010. At a press event in Tokyo, the games giant showed off the Nintendo DSi LL which will feature a 4.2 inch screen. 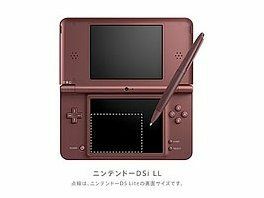 The DSi LL will come bundled with a bigger pen and three titles pre-installed and will sell in Japan at 20,000 yen – which is around £135. Nintendo has also confirmed that the price in Europe will be 'higher' than the current DSi price - unsurprisingly! The screen is certainly a big increase on its predecessor – falling just short of double the size. We'll be badgering Nintendo UK for an answer in the course of the coming days and weeks.